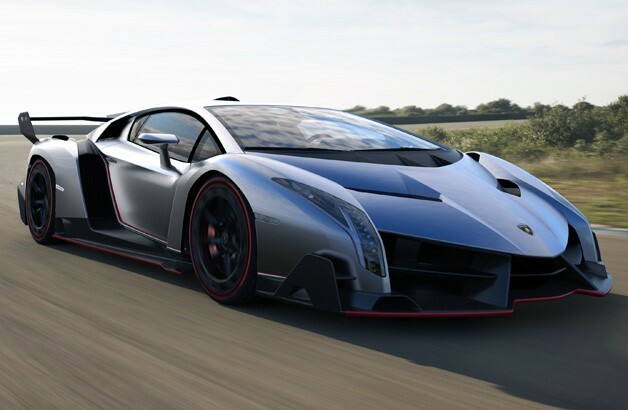 Lamborghini celebrated its 50th anniversary at the Geneva motor show with the Lamborghini Veneno, a 740bhp road-going racer based on the Aventador. Lamborghini has said that all three units of the Veneno it will make have already sold for about €3 million (Rs 21.4 crore) each. The Geneva model is a Lamborghini prototype that it will continue to be tested on road and track. Its body, like the monocoque chassis, is fashioned entirely from carbon fibre-reinforced polymer. The bodywork is optimised for aerodynamic efficiency, creating downforce, reducing drag and cooling the 6.5-litre V12, which has had a 50bhp hike from its 690bhp state of tune in the Aventador. The carbon fibre tub and aluminium subframes from the Aventador are carried over to the Veneno but adapted for its more extreme performance. The twelve-cylinder with a displacement of 6.5 liters is a thrilling combination of absolute high-revving frenzy and phenomenal pulling power. Its output has been raised to 552 kW/750 hp, facilitated through enlarged intake paths, optimized thermodynamics, a slightly higher rated rpm and an exhaust system with even lower back pressure. The ISR manual gearbox, permanent all-wheel drive and pushrod suspension have all been specifically adjusted to meet the demands of the Veneno.